Currently, digital tools and apps are too disparate. An “operating system” connecting all areas of the business would improve kitchens’ efficiency whilst helping chefs become more open to new technology. Kevin Duffy, Winnow Co-founder said: “If there is a platform that can tie all the tools together, then you can do some pretty amazing things. There is not an operating system for the kitchen yet, and I think that can be one of the greatest opportunities for the coming years”. We held a powerful panel discussion as part of London Food Tech Week 2017, which is the world’s largest collaboration of startups, thinkers and companies developing technology to transform the food ecosystem. Moderated by Lisa Jenkins, product and supplier editor at The Caterer, we brought together a diverse panel of experts to discuss the implications of technology for chefs, and the trends likely to affect the industry in the near future. Denise Obsajsnik, entrepreneur and founder of My Chef’s Table, said: “In order for the industry to use technology you need to have the front of house, you need to have the manager, you need to have the marketing buy-in as well, because they are the ones who are going to help get the chefs to buy into the game. It’s a team effort”. Operators in the hospitality sector are normally complex businesses facing difficult challenges, such as regulations, increasing labour costs and increasing in food costs. Technology has the potential to help the industry by enhancing the kitchen’s efficiency, profitability and sustainability. Therefore, to get the technology into the kitchen more broadly is important to connect all the platforms available, making innovations simpler and more accessible. But, according to the panelists there are other improvements that can facilitate the acceptance of new technologies within the kitchen. For instance, behaviour change can be driven by education. The panel agreed that chefs should start being introduced to tech tools when they are still in training, because the young generation already responds to technology. For them, adoption is much easier. Furthermore, chefs are often overworked and underpaid says Hulya Erdal: “A lot of times chefs will resent doing anything extra because they are already working 15 hours a day and not earning the equivalent amount. I think this is where there is a problem that is encouraging chefs to be resilient to accept new technologies”. For her, there is an urgent need for the industry to recognize these professionals and the incredible work that they do. Adoption is slow, but change is already taking place. 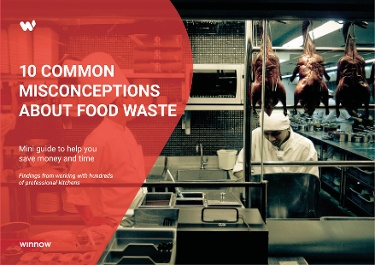 With an easy system, chefs can now control their food waste and have a more sustainable and efficient operation. They can also share their inspirations with diners, and even get live feedback about their latest creations. For food campaigner Paul Newnham, the next tools will probably deliver radical transparency, giving consumers more information about what they are eating. In addition, tech will probably play an even more important role in storytelling. “From a restaurant experience and from a chef perspective it is really in storytelling. The ability to innovate and to be able to pivot, and reimagine that in different ways is actually going to be critical”. Overall, there is huge potential for technology to help chefs in their kitchens. According to our panelists, technology will become mainstream in commercial kitchens once there are systems that can connect multiple areas, creating a connected kitchen. The great news is that the revolution has already begun. At Winnow, we develop a technology to help chefs reduce food waste, allowing them to spend more time doing what they love: cooking. We feel positive about the future and we are happy to continue helping kitchens become more efficient and sustainable, allowing chefs to concentrate more on the craft and less on the administrative tasks. We are looking forward to seeing which technologies will impact the sector in the upcoming years. Hulya works as a chef, educator, marketer and culinary consultant, developing cookery courses and training others to be chefs. From charity organisations to private institutions, Hulya utilises over 20 years of food knowledge and experience within the catering and hospitality sector to benefit educational establishments looking to grow their brand and advance in the world of gastronomy. Paul Newnham currently heads up the SDG 2 Advocacy hub – coordinating global campaigning and advocacy to achieve Sustainable Development Goal (SDG) 2: To end hunger, achieve food security and improved nutrition, and promote sustainable agriculture by 2030 based out of the UN World Food Programme. He has over 20 years’ experience in National and Global roles with a focus on Campaigning, Youth Mobilisation, Advocacy, Marketing and Communication. Paul is passionate about helping bring in new voices to the Global goals conversation particularly around Zero Hunger. After spending over 15 years in financial services across Programme Management and Sales roles, Denise has ventured into the start up technology space. She had created My Chef’s Table app which aims to create a visually engaging and enhanced dining experience and share the story of the chef and of their dishes including sourcing and approach to their creations.